Summary: Blue is an orphan who lives at a newspaper office and works as a newsboy…except that she’s really a girl in disguise. Her country is at war, and only boys are supposed to sell the important newspapers that tell the people what’s going on. Besides having to keep such a big secret, Blue is happy, enjoying her work and the people she lives for. Then she meets Jack, a mysterious inventor, and Crow, an even more mysterious boy. As she slowly learns their secrets, she starts to suspect that the people in her life aren’t always being truthful, and she can’t believe everything she reads in the paper. By the end of the story, she is ready to reveal the truth about herself and to prepare to take a potentially dangerous trip to help her new friends. 208 pages; grades 4-7. 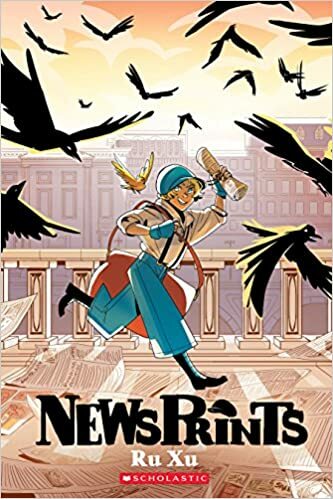 Pros: Graphic novel fans will love the latest entry from Scholastic’s popular Graphix imprint. Blue’s world is filled with intrigue, fascinating characters, and dozens of fairy tale references. The art will draw readers in; by the end, they will be eagerly anticipating the next installment. Cons: There were a lot of characters and storylines to keep track of.